August 24, 2018 Epic may want you to doubt the poop story, but we’re making sure it’s recorded for posterity. Fortnite is a free-to-play game, available to enjoy on a multitude of devices, including PC, phones, and Nintendo Switch. All those devices are, in theory, portable. You could even take them into a bathroom and play Fortnite while you ride the porcelain bus. 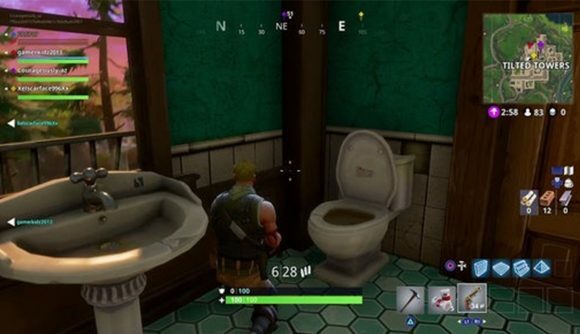 That wasn’t enough for one Gamescom attendee, whose desire to play Fortnite at the conference led them to – allegedly – poop in a bag and leave it on the show floor. Official word is that it never happened. But what are you going to believe – the official story or some rumor from the internet? The story goes somebody didn’t want to give up their position in the Fortnite line to head to the bathroom, so they took matters into their own, uh, hands, leaving the remains in a not-so-tidy bag. The suspect in this manure mystery is still at large, but reports from the show floor suggest a state of emergency once the stench began to permeate Hall 8, where the Fortnite booth is located. According to PlayNation.de (coming to us via the vagaries of Google Translate), the smell got so bad that one child in the area vomited. Gamescom cleaning staff were reportedly reticent to do anything about the bag of human feces. Understandable, though it’s not like anybody else would solve the problem. Eventually, a senior member of the staff was forced to intervene and do the duty. While you and I might be wondering why you wouldn’t wait to just play Fortnite at home, there’s a likely answer for that: an exclusive cosmetic. Attendees got a Llama spray for playing the game at the show, and the codes are a hot commodity, currently going for around $100 on eBay. Whether the turd culprit wanted the cash or the skin, I have to say that’s a pretty low price for that much human dignity. We’ve got conflicting reports, though – Epic’s Nick Chester says on Twitter that it didn’t happen. But he adds “If this had happened, how would anyone have been able to tell at gamescom, though?” I’m not sure which version of Schrodinger’s poop I’d prefer. Remember, kids – always wash your hands before you thank the bus driver. And please put your self-respect ahead of your need for Fortnite.